Salinger is conspicuously described at the top of that article as working for the University of Auckland — but as the university’s web site doesn’t list him as working for them, it seemed to be a fabrication. You don’t have to believe me: you can check it out for yourself. As a first response to the misrepresentations in the article, I thought I’d highlight the misrepresentation of Salinger’s status. So I sent the following letter to both the University of Auckland and the web site’s Executive Director, Andrew Jaspan, advising them of Salinger’s doubtful claim to be working for the university. I write to draw your attention to a possible breach by Dr Jim Salinger of the University’s rules. Dr Salinger wrote an article published at The Conversation (Australian edition) on 23rd January. That web page describes Dr Salinger as “Honorary Research Associate in Climate Science, School of Environment at University of Auckland” but your University’s web page at http://www.env.auckland.ac.nz/en/about/our-people/honorary-staff.html does not include him in the list of honorary staff. This deceptive description could reflect badly on the School of Environment and the University. His status with the University of Auckland appears to have been misrepresented and his opinions thus lent more gravitas than they perhaps deserve. My readers are keen to be assured that this misrepresentation is either not what it seems, or will be brought to an end. Thank you for your message. Dr Salinger is indeed an Honorary Research Fellow in our School. This was arranged late in 2012. Jim will be added to the website in the near future. So, no deceit was involved, but it’s disappointing that updates to a world-leading university’s web site can languish undone for over a year. Action seems to wait on a public complaint. I’ve had to rejig this post to make a different point, but I think it’s still quite interesting — and it’s only the beginning. We still have to refute his activist rubbish. Irony upon irony. With the recognition that ‘The Pause’ could be part of a natural cycle, associated with the PDO, El Niño, La Niña, and their relative importance compared to CO2. This relationship was included as a sentence or two by Dr De Freitas several years ago. This very paper was one of the papers at the centre of Climategate. And that paper, suggesting the importance of El Niño in warming, was one that none other than Salinger himself tried to undermine De Freitas’s standing at the university. So who is the attacker here? There’s much more to this story than Salinger will tell us. And of course now they are ducking for cover, sending us off in tangents. So where is the missing heat? Trenberth suggested it’s hiding in the oceans. Well if it was you couldn’t know it for sure. The specific heat of water and it’s quantity would mean the temperature difference would be immeasurable. So what has happened to the net greenhouse effect over the past decade or so (that is supposedly trapping the heat by reducing the OLWIR. Has more heat been trapped by it? I downloaded the OLWIR from NOAA late 2013, and computed the global average, to see if there was any global falling trend. Up and downs, a visible annual cycle, but if anything it has very slightly been rising indicating a slightly more transparent atmosphere ( to OLWIR). So where is the missing heat? It has gone back out to space like it always has. But then, what would I know? I’m just an middle aged, white, electrical engineer, obviously biased, male. Appreciate what yo do Richard. Keep up the good work. Jim Salinger was on board at UofA I thought. I’m more interested in his itemized list of “lots of errors” that NZCSET made auditing the 7SS according to him. SimonP pointed us at BEST a couple of days ago as corroboration for NIWA. Turned out worthwhile. Ironically, BEST’s Albert Park station breakpoint adjusted trend corroborates the Trust’s to-the-letter application of RS93 (of which Jim Salinger was co-author) for the Auckland location but falls very far below NIWA’s trend. BEST’s breakpoint adjustment method (probably cited in BEST’s Methods paper somewhere) appears to be similar to BOM’s ACORN-SAT because there’s lots of “empirical break” adjustments, far more than actual site change adjustments in some places. But that is not to say the adjustments are not valid. They seem reasonable but I’ve only really skimmed over some. The BEST long running station series resulting from breakpoint adjustment have trends below NIWA’s corresponding locations and not much above the Trust’s for BEST’s Albert Park, Kelburn, and Mussselburgh stations for example, which correspond to 7SS locations Auckland, Wellington and Dunedin respectively. The warming begins at BEST when they then run the adjusted stations through their infilling algorithm (they make up data) to produce location and national composite output but more on that below and in the following comment(s). After breakpoint alignment they get 0.64 °C / Century for Albert Park (AP) but that doesn’t account for AP’s UHI and sheltering contamination (no UHI Quality Control). 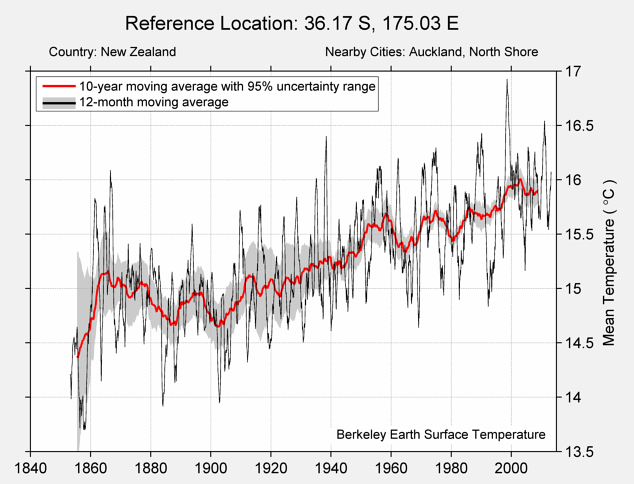 Thus BEST corroborates the NZCSET’s RS93 0.48 °C/century Auckland trend and eliminates NIWA – congratulations Jim! No Te Aroha or Ruakura note. Next comment, a case study of BEST Hamilton. Or, how to create a 0.98 °C/century trend when your nearest data is AUCKLAND AERO AWS	86kms away. The Hamilton location station list can be accessed from “More stations…” on the sidebar. BEST Hamilton & Waikato temperature case study. Auckland is bounded by two harbours and ocean on either side. Not surprisingly then, It is very humid in the warmer months at times. The Waikato is landlocked except to the north and is bounded on the east and west by mountain ranges. it is frosty in the cooler months and fog fills the basin regularly. Tauranga is on the other side of the eastern mountain range beside the ocean in the Bay of Plenty but BEST imputes that climate to the Waikato too as we will see. 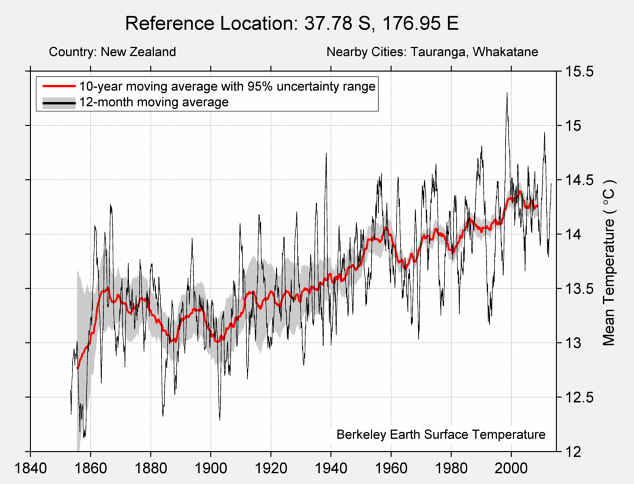 The Te Aroha 40 year 1930 – 1970 trend is 0.05°C or 0.0125°C/decade. The Te Aroha profile is shown on Hessell Figure 4 and is similar to the BEST Hamilton profile (linked below) over the same period but with 1930 at the same level as 1970 whereas BEST has 1930 considerably lower than 1970 presumably due to non adjustment for UHI/sheltering at Albert Park. Most importantly, note Te Aroha is at about 14.4 °C in 1930 and about 14.6 °C in 1970. NIWA’s Ruakura series is a very simple profile. Basically, a 0.7°C rise over the first 40 years 1931 – 1970 and negligible warming (flat) for the second 40 years 1970 – 2009 (0.04°C). But many trees were planted at Ruakura when the research station was established that grew to near maturity by the 1970s and the urban fringe extended out to the station over that time. Accordingly, adjustment for UHI and sheltering would have to be made to Ruakura similar to that made to Albert Park by the NZCSET Statistical Audit (see Supplementary Information). The Albert Park adjustment is substantial (-0.53°C from the data by 1973 from 0 at 1916) but NIWA did not make that adjustment, neither was a similar adjustment made for Ruakura as far as I know. As we will see below, BEST Hamilton absolute level is far too high over the 20th century, or, if compared to Te Aroha, their 2000 level is spot on Te Aroha in 1970 and just a little above Te Aroha in 1930. But their 1930 and 1970 levels are ridiculously low compared to Te Aroha. Only Taupo is in the Waikato district but very much South Waikato and completely different environs to Hamilton but they could only start using that in 1996 anyway. If Te Aroha had been used, the 14.4°C in 1930 and 14.6°C in 1970 would have produced higher levels in BEST Hamilton for that period similar to their 14.5 2000 level instead of 13.7 and 14. But NIWA reports that the 2013 Hamilton mean was 14,2°C, 0.6 above average. So the climatological average for Hamilton is 13.6°C (14.2 – 0.6), well below BEST’s 20th century levels anyway. Obviously, Ruakura is cooler than Te Aroha. NIWA’s 1930 absolute without adjustment works out to be 12,47, a bit low compared to Te Aroha 14.4. NIWA 1970 is more realistic at 13.2 and 2000 at 13.64. This indicates Ruakura was perhaps 1.4°C cooler than Te Aroha’s 14.6°C at 1970 giving around 13 in Hamilton instead of 12,47 at 1930 if a 1.4 difference is applied but that’s conjecture, a proper adjustment should be made to Ruakura. Clearly, BEST methodology is invalid in the case of Hamilton because when actual measured temperatures are used to check the kriged (interpolated i.e. made up) BEST output from their mathematical model, neither the absolute values, nor or the profile, nor the trends, are verified. And if BEST is invalid for Hamilton and the Waikato, then it is probably invalid for large swathes of the rest of the world too. BEST’s Auckland, Tauranga and Hamilton series are all but exactly the same. The only difference is the series moves up and down the y axis.